Seeking to detect mysterious, ultra-high-energy neutrinos from distant regions of space, a team of astronomers used the Moon as part of an innovative telescope system for the search. Their work gave new insight on the possible origin of the elusive subatomic particles and points the way to opening a new view of the Universe in the future. The team used special-purpose electronic equipment brought to the National Science Foundation's Very Large Array (VLA) radio telescope, and took advantage of new, more-sensitive radio receivers installed as part of the Expanded VLA (EVLA) project. Prior to their observations, they tested their system by flying a small, specialized transmitter over the VLA in a helium balloon. In 200 hours of observations, Ted Jaeger of the University of Iowa and the Naval Research Laboratory, and Robert Mutel and Kenneth Gayley of the University of Iowa did not detect any of the ultra-high-energy neutrinos they sought. This lack of detection placed a new limit on the amount of such particles arriving from space, and cast doubt on some theoretical models for how those neutrinos are produced. Neutrinos are fast-moving subatomic particles with no electrical charge that readily pass unimpeded through ordinary matter. Though plentiful in the Universe, they are notoriously difficult to detect. Experiments to detect neutrinos from the Sun and supernova explosions have used large volumes of material such as water or chlorine to capture the rare interactions of the particles with ordinary matter. The ultra-high-energy neutrinos the astronomers sought are postulated to be produced by the energetic, black-hole-powered cores of distant galaxies; massive stellar explosions; annihilation of dark matter; cosmic-ray particles interacting with photons of the Cosmic Microwave Background; tears in the fabric of space-time; and collisions of the ultra-high-energy neutrinos with lower-energy neutrinos left over from the Big Bang. 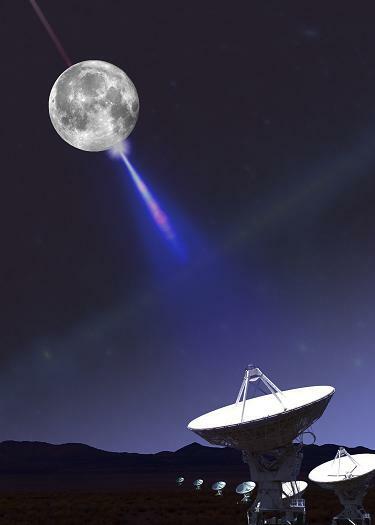 Radio telescopes can't detect neutrinos, but the scientists pointed sets of VLA antennas around the edge of the Moon in hopes of seeing brief bursts of radio waves emitted when the neutrinos they sought passed through the Moon and interacted with lunar material. Such interactions, they calculated, should send the radio bursts toward Earth. This technique was first used in 1995 and has been used several times since then, with no detections recorded. The latest VLA observations have been the most sensitive yet done. "Our observations have set a new upper limit -- the lowest yet -- for the amount of the type of neutrinos we sought," Mutel said. "This limit eliminates some models that proposed bursts of these neutrinos coming from the halo of the Milky Way Galaxy," he added. To test other models, the scientists said, will require observations with more sensitivity. "Some of the techniques we developed for these observations can be adapted to the next generation of radio telescopes and assist in more-sensitive searches later," Mutel said. "When we develop the ability to detect these particles, we will open a new window for observing the Universe and advancing our understanding of basic astrophysics," he said.